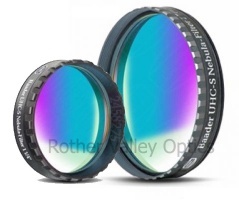 This high performance CCD filter transmits only the Hydogen Beta emission line, and therefore is useful for greatly increasing the contrast of objects that glow in the corresponding region of the spectrum, for example the Horsehead, Cocoon and California nebulae. The O-III narrow band-pass filter isolates just the two doubly ionized oxygen lines (496 and 501nm) emitted by diffuse, planetary and extremely faint nebulae. 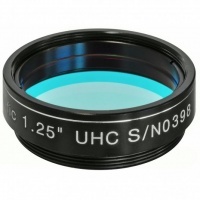 The narrowband UHC filter, like the O-III filter, isolates the two doubly ionized oxygen lines (496 and 501nm) in addition to the hydrogen-beta line (486nm) emitted by planetary and most emission nebulae. 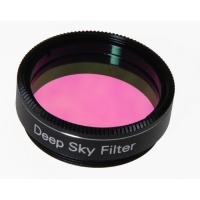 OVL Deep Sky Filter 1.25"
This filter blocks low and high pressure mercury and sodium vapour lamplight and neon light whilst letting the rest of the visible spectrum through. 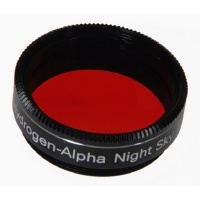 Excellent for viewing all deep sky objects under the urban sky. 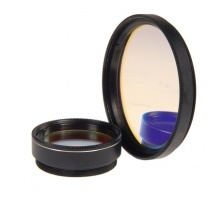 Standing for "City Light Suppression", the Explore Scientific 1.25" CLS Nebula Filter is not just for observing nebulous objects, as it lets a broader swathe of wavelengths through to the observer than either the OIII or UHC Explore Scientific filters do. 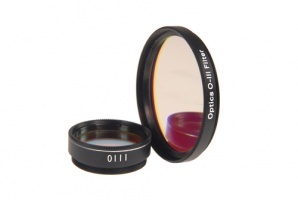 OVL Hydrogen Alpha CCD Filter 1.25"
This long-pass filter limits transmission of light with wavelengths longer than 650nm. Whilst suppressing all other polluting lights, the filter allows you to observe emission nebulae with greatly enhanced contrast. Observing difficult, dim Deep Sky targets like Planetary Nebulae and certain supernovae remnants, such as the Veil Nebula in Cygnus from light poluted environments can be a very tricky business. 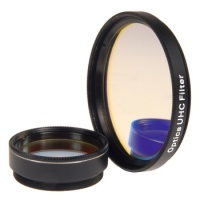 This is where the Explore Scientific 1.25" O-III Nebula Filter shows its strengths. 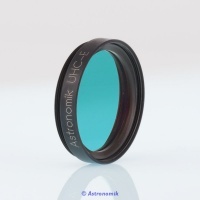 The Astronomik UHC-E filter is our budget filter for deep-sky observation of emission nebulae and comets under light polluted skies. It’s particularly suitable for small ’scopes.